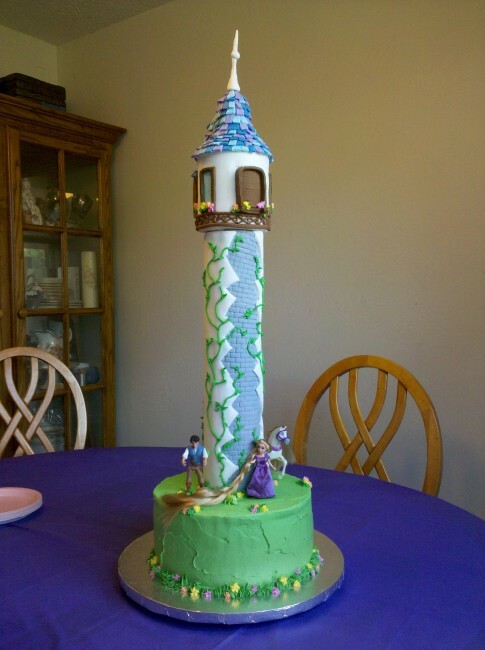 I was going through my cake photos recently looking for inspiration for the holidays and I came across the pictures of my youngest daughter’s 6th birthday cake. She’s 7 and a half now, but even though a year and a half has passed, I’m still incredibly proud of this creation of mine. At the time, Sophia was absolutely head over heels in love with the Disney movie Tangled. I’ve always let my children dictate what they want for their own birthday cakes every year. They take such great delight in it and I love making them, so I never really considered that they might want something that I couldn’t make. 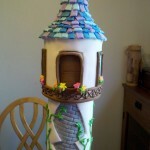 So naturally my little overachiever Sophia asked for the most difficult thing from the movie: Rapunzel’s tower. 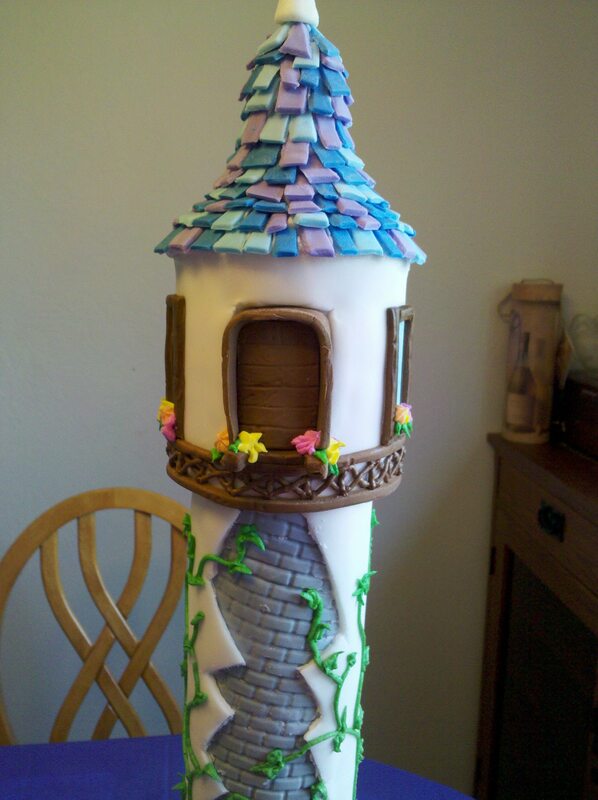 Seeking inspiration, I spent several evenings scouring the internet looking at castle and Rapunzel related artwork, drawings and cakes, some good…some really terrible…all in the days before the glories of Pinterest. Finally I happened across this beautiful cake and then it all clicked. This, I could totally rock. I decided on an in-edible tower anchored in the middle of a round chocolate cake. I started by gathering the items to make the base of my tower: an unused mailing tube, an empty cashew can, two cans of peaches (one emptied and rinsed, the other still sealed) and a flexible piece of cardboard. If you are going to give this a go yourself, make sure the cans will fit inside your mailing tube. I began by using a hot glue gun to attach the cleaned peach can to the bottom of the nut can and to attach the full can to my cake base. This made the tower incredibly stable and allowed me to make the living portion of the tower on something more manageable yet easy to add securely to the design later. I also added a cone shaped roof to the nut can as well as a bumped out bay window using the cardboard and hot glue. 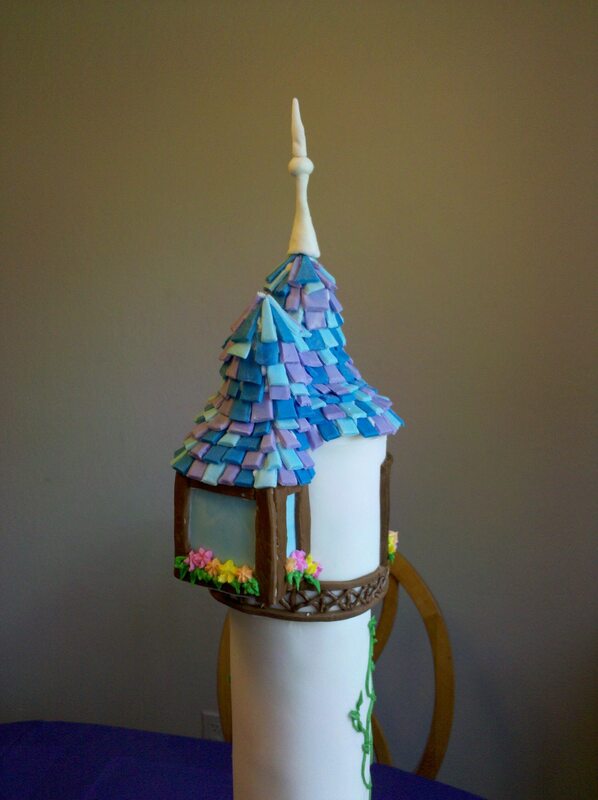 You’ll notice in the pictures below that the roof actually has more than one peak and the shorter one was done simply with frosting under the tiles. 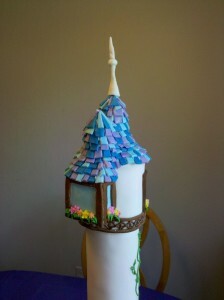 Next I used a brick texture tile from Duff on Wilton fondant that I had tinted gray. Texture tiles are fun if you’re doing something small, but I’ve found that it’s easier to get a clean imprint if you place the tile or imprint mat on -top- of your rolled out fondant and then press it in to get the impression. Doing it the other way with the mat between the counter and the fondant results in a muddy design for me nearly every time. I attached the gray brick with a little bit of water, then added the white fondant wrap in the same way, cutting it carefully with a paring knife as I went. At this point I got my cakes in the oven which was fairly straightforward since they were plain chocolate and then I sat down to focus on the living quarters. Sophia had seen the pictures by this point, so I was charged with making it -exactly- the same as the picture as I shuffled her off to bed. Kids. I hand tinted all the fondant and applied it using a little water for the most part, however the tiles were stuck on with buttercream. I actually had an absolute blast putting the little house together, though there are a few things I would have done differently if I had to do it again. I think I would have done some sort of painted detail on the window panes themselves and perhaps some lightly painted cracking to simulate plaster on the white stucco parts. I also would have been a little more careful about keeping the top spire straight and I would have added the wooden buttresses underneath the living space. 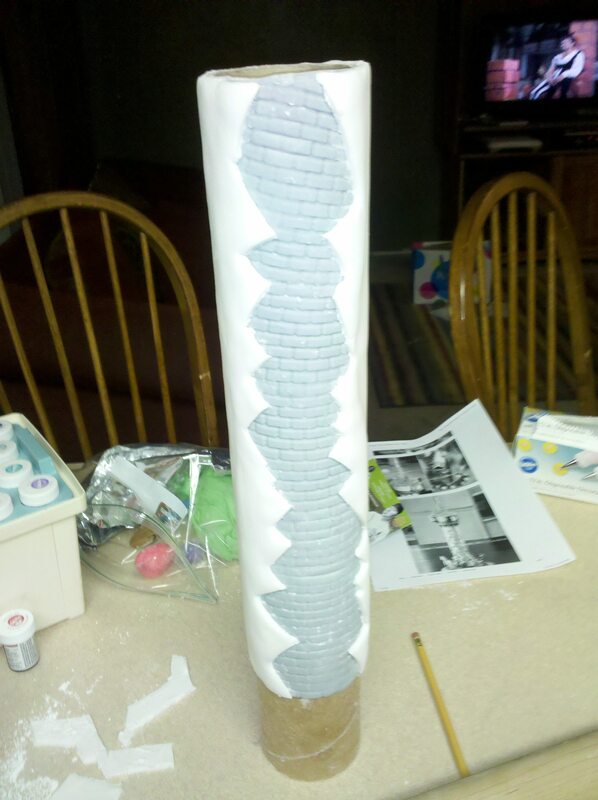 Once the cakes were done and cooled, torted, filled and stacked, I used a cookie cutter that was close to the size of the mailing tube to cut a hole in the cake. I then took the donut shaped cake, carefully put it on the prepared cake board and frosted it with green tinted buttercream frosting. I took the mailing tube and covered the rest of the exposed cardboard with foil and then lowered it into the hole in the cake and around the peach can that was glued to the board. It fit perfectly with no wiggling. Using a grass tip and the same green buttercream, I added grass detail around the edges where the cake met the board and the cake met the tower as well as some small patches here and there for detail. I switched to a straight tip (I believe it was a #2 or #3) and piped the vines, then the leaves with a #352 leaf tip. Finally, I added flowers in various hues to both the cake and the living quarters and the figurines which were part of her birthday surprise. I simply smile and say yes, yes I do.